This is the incredible moment an elusive mother snow leopard and her cub observe a hidden video camera in their natural habitat. Filmed in Mongolia in February the just-released vision shows the magnificent cats scoping out the mysterious object on a rocky shelter in the Himalayan Mountains. The stunning video comes as the WWF seeks to shine light on the alarming decline in snow leopard populations throughout their sole habitat of Central Asia. A new WWF reports shows the already endangered species could have their dwindling populations devastated by global warming. 'Urgent action is needed to curb climate change and prevent further degradation of snow leopard habitat, otherwise the 'ghost of the mountains' could vanish,' head of the fund's global snow leopard conservation initiative Rishi Kumar Sharma said in the report. Habitat loss and degradation and poaching has wiped a fifth of the snow leopard population in the past 16 years alone-and they could soon be pushed to the brink of extinction. 'Snow leopards won't survive for long unless we tackle climate change alongside other threats such as poaching, retaliatory killings by herders, declining prey species and poorly planned development,' Tornikoski said. 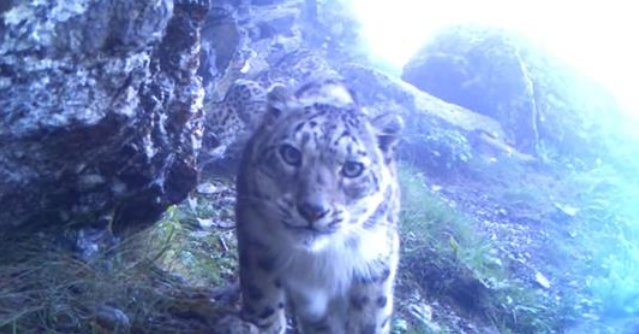 Responses to "Rare Snow Leopard Crawls Curiously Up To Hidden Camera In The Himalayas"